Photos and video by Jason Ruiz. And for over two months, Hippie Chuck, as he prefers to be called, and the rest of the occupants were forced to defecate and urinate in a bucket while they waited for their landlord to make necessary repairs. The home wasn’t zoned or registered to be a sober living facility. And in addition to Chuck and his five roommates, roaches, rats and mice also called the unit home. 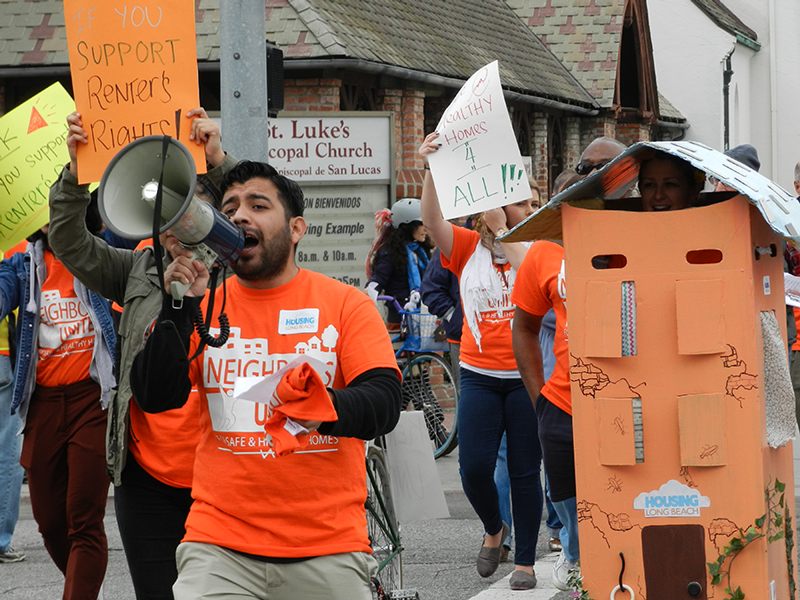 When there were complaints made about the living situation, the tenants were met with threats of raised rents, evictions and the alternative of being homeless. While these horror stories may represent only a small minority of Long Beach landlords, Chuck’s tale is one that is heard and seen (and smelled) by Kerry Gallagher far too often. Gallagher, the executive director of Housing Long Beach (HLB), a community organization aimed at improving the living conditions and the affordability of homes for Long Beach residents, said that some of the conditions are what you’d expect in developing countries—but they’re happening right here in this city. Johnathan Bibriesca leads the chant outside St. Luke’s Episcopal Church, the origin of the march. People like Chuck and the countless others Gallagher has led to the pulpit at City Hall over the last several weeks to testify during public comment in front of council members are the reasons why for the past two-plus years she’s been a strong advocate of bringing increased renters’ rights to Long Beach. In particular, she’s fighting to have Long Beach adopt the Rent Escrow Account Program (REAP), which would establish an avenue for renters to pay their rent, or a reduced rent, to the City once a problem landlord has failed to bring their units into compliance with local codes. The money paid into the escrow account would be released to the landlords once the issues that landed it in REAP were resolved. The current alternative is to take the case to court, which Gallagher said is troublesome for many reasons. With the burden of proof being placed on the renter, it’s extremely difficult to demonstrate that actions are retaliatory in nature. Because most of the people being affected are low income and legal representation is expensive, they often have to represent themselves in court. 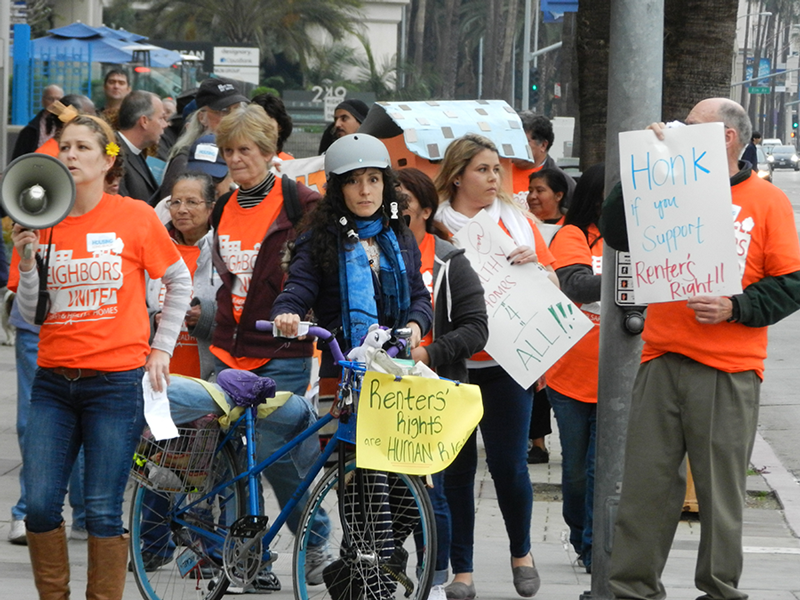 Gallagher (left) leads the march down Long Beach Boulevard. According to statistics compiled by the Department of Housing and Urban Development, almost 60 percent of Long Beach residents are renters. Several cities in California, including Sacramento, Santa Monica, San Francisco, Oakland and Los Angeles have adopted the program to help bring units that are out of code back into compliance. Los Angeles has had REAP for over 30 years, and according to an official from the city’s compliance division of the Housing Community Investment Department, it has been very successful. The official, who asked to remain anonymous, stated that Los Angeles brings hundreds of properties into compliance every year through REAP. In 2014, the city tabulated 500 units that successfully exited REAP after necessary repairs were made. The City of Los Angles has over 760,000 rental units but currently only 4,000 in REAP, which representatives see as proof that the program is working in a proactive way, as less than one percent of the housing stock is in REAP. The process includes several steps before a unit is placed into the program and it usually takes about four months from the first violation being reported to the unit entering REAP, with several opportunities for landlords to remedy the issues. The program is funded through fees that are paid by the property owners that have units in REAP. The landlords must pay $50 per month for every unit in REAP, a sum that is subtracted from the balance in the escrow account. To put it simply, “[i]t doesn’t cost the city any money,” the Los Angeles official said. Gallagher secured the inclusion of the program in the recently passed 2013-2021 Housing Element, with a promise that city council would explore bringing it to the city. The Housing Element identifies policies, programs and objectives that focus on improving the health, affordability and the development of the city’s housing stock. Gallagher said the discussed timeline of January 20 set by the city staff came and went, which is why she organized the march to city hall last night. 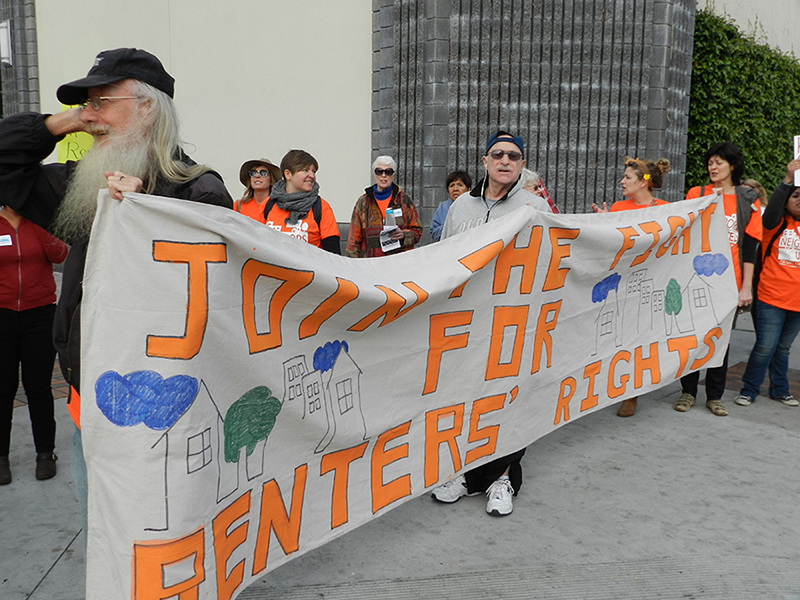 A group of nearly 70 renters, landlords and organizers marched through the streets of downtown yesterday, holding signs reading “Renters Rights are Human Rights” and “Safe and Healthy Homes 4 All” and chanting things like “We want a home that’s nice, not the roaches and mice”. They snaked their way down Long Beach Boulevard and headed west on Ocean Boulevard receiving applause and honks of approval along the way. They finally reached the courtyard outside city hall where they turned their signs and megaphones upward. “What do we want?” they shouted. Vanessa Davis speaks to the crowd assembled outside City Hall Tuesday January 20. Vanessa Davis, a soon-to-be board member at HLB, shared with the assembled crowd her own story of how she battled intimidation after reporting her sub-standard living conditions. She had her rent raised after reporting her landlord to code enforcement, was served with two separate eviction notices and now lives in a shelter after eventually leaving the unit. Davis’ case was never heard in court, as the landlord’s lawyer decided to drop the case. Deputy Director of Neighborhood Services Angela Reynolds said that there are current protections in place to keep buildings up to code and to protect the people inhabiting them. She cited the proactive Housing Habitability Ordinance that the city has had in place for over 20 years. She said that the program has a 90 percent compliance rate within 120 days of the first reported violation. She did add the city doesn’t enforce retaliation claims or represent people in court, since that is a State matter. Reynolds said that when a facility is found to be in violation, the landlord receives an administrative citation of $100. If it’s found to still be in violation after 30 days a $200 citation is given followed by a $500 citation if another 30 days passes without the unit being brought into compliance. Although rare, Reynolds said offenders are fined $500 per week after the 120 day mark and the case is then sent to the city prosecutors office for criminal action. In 2012, the city performed 2,652 of these inspections—short of its stated goal of assessing an average of 5,500 multi-family units annually to correct code violations. According to the adopted housing element, there were over 90,000 multi-family homes in the city as of 2011. Gallagher said that while the ordinance could be viewed as a REAP alternative, less than 10 percent of the units are checked annually. “I don’t know if that’s necessarily the most effective way to identify the scope of problems,” Gallagher said. First District Council Woman Lena Gonzalez, who served as a field deputy to Mayor Robert Garcia when he was a council member, has seen first-hand the horror stories that HLB is trying to write a final chapter to. Gonzalez is supportive of the issue and thinks that with Long Beach being much smaller than LA, the program should be more manageable to run here. With over 50 percent in her district being renters and the other half being home owners, she added that a program like this could be mutually beneficial as property values increase with the elimination of blight, and so too would living conditions. However, the unknown costs to the city and how it would affect staffing—and the fact that it has yet to be presented to council—remain as obstacles. 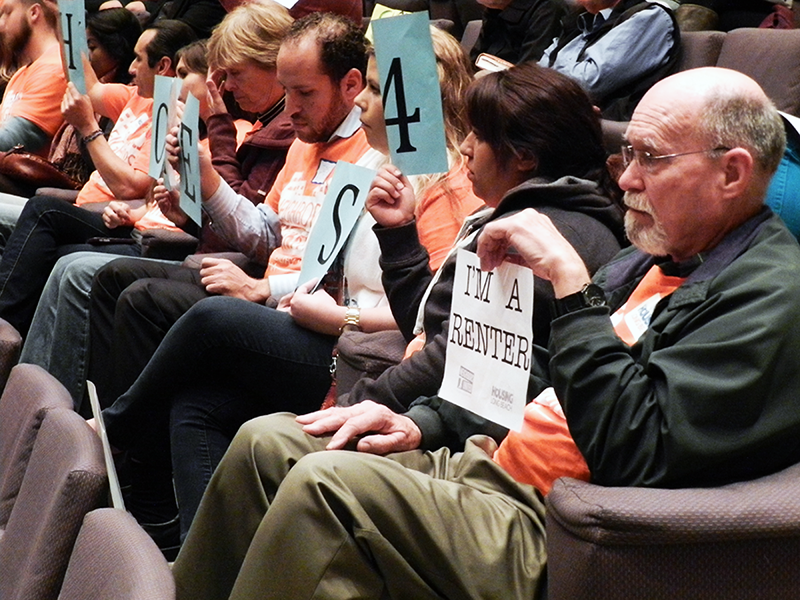 Members of the rally hold up signs spelling out “Healthy Homes 4 Long Beach” during public comment.